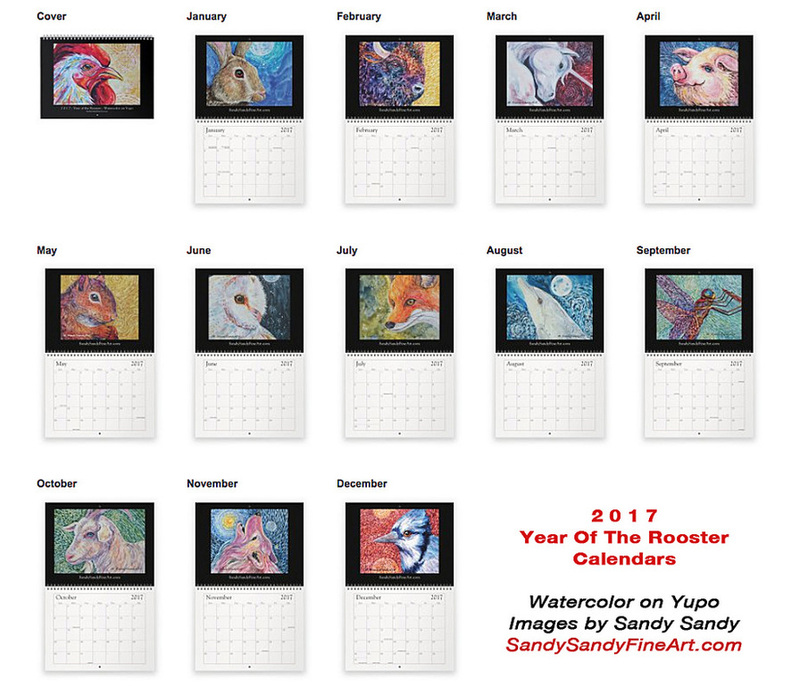 This calendar makes a powerful gift for yourself and for all the animal lovers on your holiday gift list! "Colorful Animals Painted in Watercolor on Yupo Paper"
Pre-Release Prices - $19.99 ea., 2 for $17.49 ea., 3 or more for $14.99.ea. Order today to take advantage of these pre-release prices! Wall calendars will be available for pick-up or will be mailed the first week of December. Locals can pick up at Sandy's Tabernacle, NJ studio and shipping will be refunded. Avoid shipping costs and take advantage of all the holiday studio specials! Call Sandy to chat today 609-268-9106. This is an 8.5 x 11" (17 x 11" opened) wall calendar with all kinds of special holidays noted. for easy jotting and features 13 animal paintings by Sandy that are suitable for framing. These vibrant paintings were all done in watercolor on Yupo paper. Feel Free to contact Sandy about her art or services at: 609.268.9106 or by email at: Sandy@sandysandy.com.